During the last seasons all carbon fiber parts for both cars were produced at the carbon fiber lab of the Oregon State University. The team and the lab were at the maximum level of capacity with producing the two chassis and both aero packages. With the new carbon fiber lab at the DHBW this is about to change. It has been two years full of planning, organizing and investing, but the lab is nearly finished. A huge “thank you” goes to the administration of the DHBW for being so helpful and supportive. Their dedication was mandatory for having been able to build up this lab. Since autumn of 2014 the planning had been completed and the first components of the new lab were installed: Workspaces and storage areas were created, new materials purchased and the large and empty hangar began to look more and more like a laboratory. 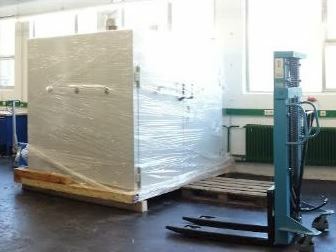 The huge refrigerator arrived and a universal test machine for traction and compression was installed. The next big step was the arrival of the oven. With its big dimensions and a weight of about 1,5 tons it was a real challenge to transport the oven from the cargo van into the lab. But all the hard work and effort put into this project were definitely worth it. The first test parts have already been produced and the production of relevant carbon fiber parts for this year’s cars are about to start in the next couple of days.